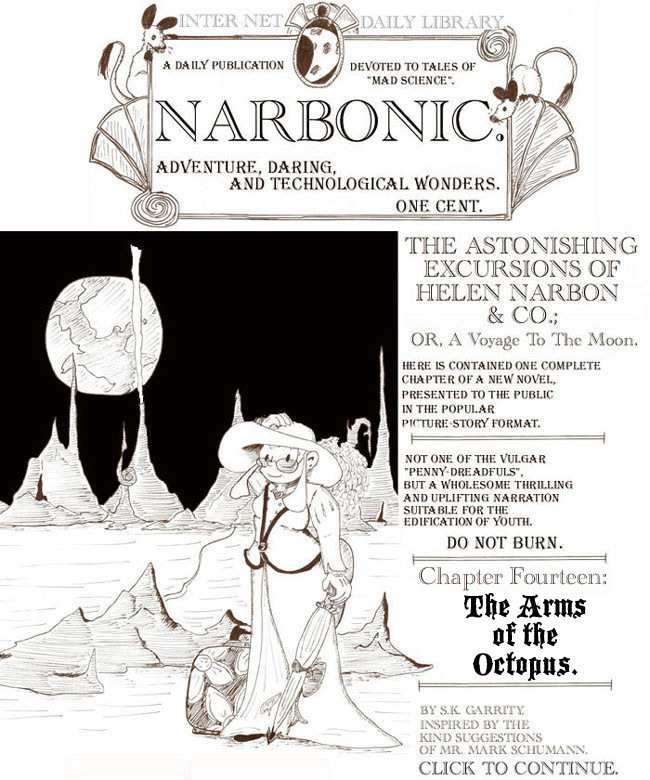 The Astonishing Excursions of Helen Narbon &Co., Chapter Fourteen. Yes, Dr. Pim appears to be interrupting Helen’s journal. No, he cannot actually hear or read it or whatever. It’s simply a clever transition device. Thank you. Dr. Pim is one of my favorite characters. It’s a shame he only appears in the Victorian story, but Venusians don’t exist in the regular Narbonic continuity. 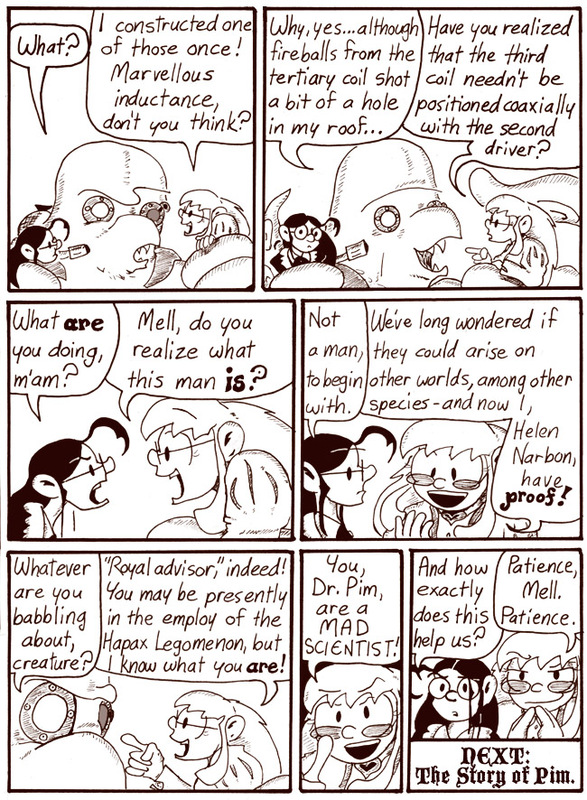 The character initially came out of my realization that I needed someone to interact with Helen and Mell on Venus. 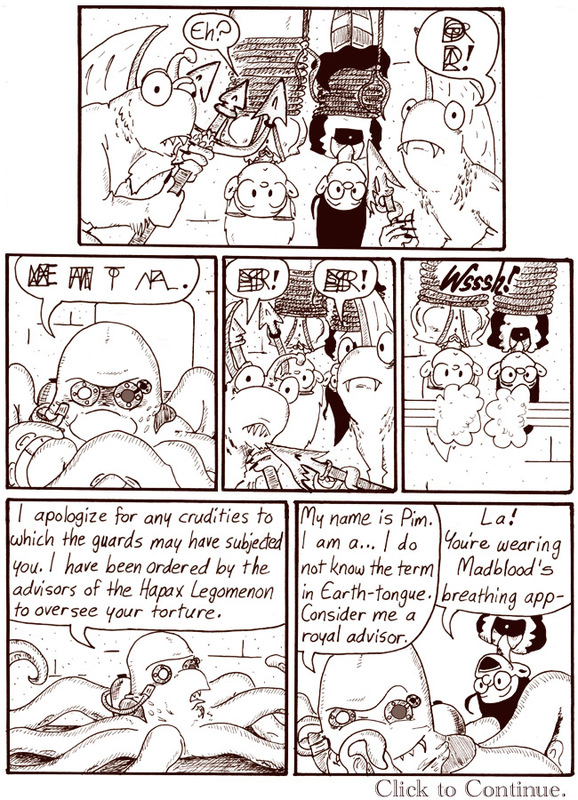 My first idea was a swordfish advisor to the Hapax Legomenon, but then I hit on the idea of an octopus mad scientist. I was probably influenced by my intense love for Doctor Octopus in the Spider-Man comics. “Magnifying transmitter” is another name for the Tesla coil, the single most essential piece of lab equipment for mad scientists. I thought that almost every mad scientist should just instinctively build Tesla coils at some point early in his or her career. The scalar wave weapon is another actual device Nikola Tesla worked on. He was basically the most awesome guy ever. 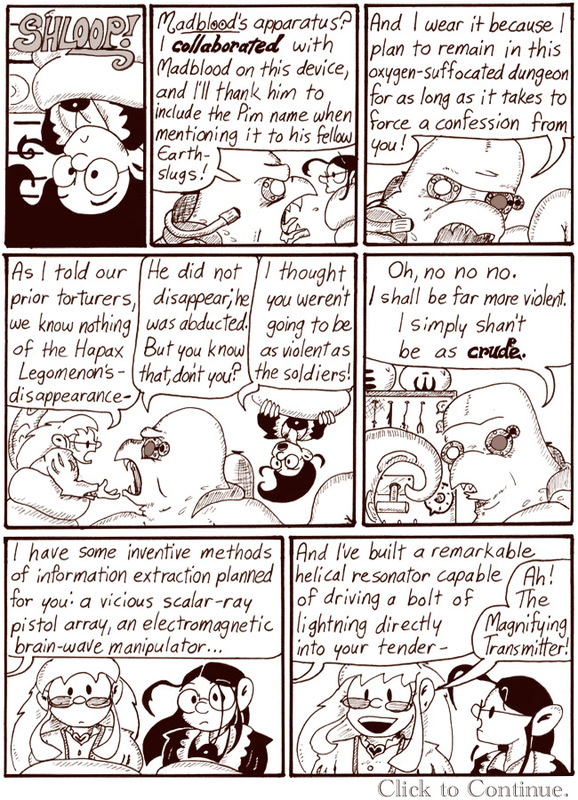 Everything Helen and Pim say here about the Tesla coil is, to my knowledge, accurate. The device Pim and Helen are discussing is presumably similar to the large, three-coil “Magnifying Transmitter” built by Nikola Tesla. In the Magnifying Transmitter, the first two coils functioned as drivers to excite a third coil, the resonator. Tesla did indeed have trouble with the enormous discharges from the Magnifying Transmitter creating fireballs until he figured out how to move the resonator around to change the frequency of the electromagnetic waves. Even in sepia-tinted space, the poison of genius infects all kinds of minds. Because not every mad scientist is evil. Some are good or even neutral. Leon: That’s because no-one, not even a mad scientist, thinks of themselves as Evil. Perhaps you’ve missed modern Helen’s favorite T-shirt? Our heroes villains are quite aware that they’re on the side of Evil. Proud of it, too, except for Artie and maybe Dave. But Dave comes around. Helen’s line in the first panel puts me in mind of the dead parrot sketch. As I recall, Edwin, he made a device capable of shaking a building down that he attached to a beam on a construction site. He really made the earth move for them.